Arlington Co. plans to expand bikesharing in the future and they've produced an interesting map showing potential demand. 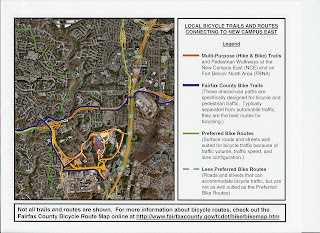 We created the map by begining with color-coding the County based on a) where the people are, with population and employment density; b) where bike facilities are, such as trails, lanes, and routes; c) where existing transit is and how well it's used; and d) some destinations, such as libraries and community centers that receive a lot of foot traffic. Fairfax Co. should be doing this in the more dense urban areas such as Reston, Tysons, Springfield, Seven Corners, and Bailey's Crossroads. It would be useful not only for bike sharing but for determining new bike facility priorities. See the full demand map. The major contested Congressional race in Fairfax is between Congressman Connolly and Keith Fimian, the two major candidates. During his political career Congressman Connolly has been very supportive of bicycle infrastructure funding. As Chairman of the Fairfax Co Board of Supervisors he authored the Comprehensive Bicycle Initiative that created the first bicycle coordinator position and developed the first bicycle route map of the county. 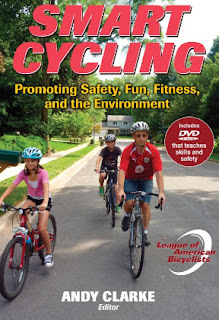 As a Congressman, he along with 23 of his colleagues sent a letter supporting Secretary LaHood's USDOT Policy Statement on Bicycle and Pedestrian Accommodation which includes "considering walking and bicycling as equals with other transportation modes." He's also supported implementation of new experimental bicycle facilities in the MUTCD and an increase in funding for bicycle and pedestrian transportation projects in the Surface Transportation Authorization bill. On Oct. 21 we asked Mr. Fimian for his views on bicycling as a form of transportation. We haven't received a response. We've searched his website for information on bicycling and transportation and "Transportation" isn't listed under Issues. This morning Fimian and Connolly debated on the WTOP Politics Program. During the interview Fimian stated that we would be much better off if we didn't spend money on bicycle trails. Once the broadcast is online we'll try to find a direct quote. If you have additional information about the two candidates' positions on bicycle issues, please leave a comment. Mark Plotkin: "Isn't it time to raise the Federal gas tax of 18.4 cents to help fund transportation in your district?" Mr. Fimian: "Listen, the problem is that massive amount of tax money is gone and they spent it on a transportation museum and flowers in the median and bike paths." Congressman Connolly: "I'm on record favoring raising the gas tax." The VDOT N. Va. District office is currently located just west of Rt 28 off Rt 50 on Avion Parkway in Chantilly. It's not a bike- or transit-friendly location to say the least. We've biked there on many occasions and the most difficult stretch is along Rt 50 under Rt 28. On Nov. 1 the N. Va. District office will be moving to new offices located off West Ox Dr. just north of the intersection of Fairfax Co Parkway and Rt 29. The address is 4975 Alliance Drive Fairfax, VA 22030. We hear new bike racks will be in place, although we've also heard they are the infamous "wave racks" that are not recommended by most jurisdictions. There is only one contact point with the bike and most people who want to use a U-lock use the racks as a very complicated U-rack, parking parallel to the rack instead of perpendicular, reducing the rack capacity from many (5-11) to 2. Sigh. The Fx Co Parkway trail passes directly in front of the offices on West Ox Rd. This is one of several sections where the trail is diverted off of the Parkway because a decision was made long ago to not purchase needed right of way or to not spend the money to build the trail over a major intersection. As a side note we've tried for several years to get wayfinding signs placed on the Parkway trail and have had no luck. We are located near the intersection of the Fairfax County Parkway, Route 29 and West Ox Road (next to Fairfax County's Public Safety Transportation Operations Center and across the street from Costco). We will share this new building with several other Virginia agencies including State Police, Department of Fire Programs, and Department of Emergency Management. All VDOT employees located in the new office will have new telephone numbers. Check the VDOT site for more information. The current office location is now listed on the site, but that information should be updated once the move takes place. 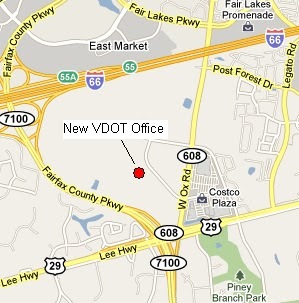 All VDOT staff located in the new office will have new phone numbers as well. Join us for a visit from Andy Clarke – one of cycling’s most popular and engaging speakers – He will be speaking at The Bike Lane on November 18 at 7 pm. 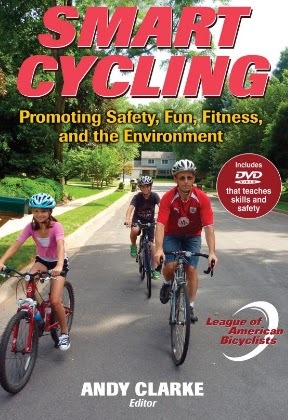 Clarke just edited a new book, Smart Cycling: Promoting Fun, Fitness and the Environment. He’ll be answering questions, signing copies of his new book, and discussing how the League is building a Bicycle Friendly America! The National Geospatial-Intelligence Agency (NGA) is consolidating operations and moving staff from three current locations; Reston, VA, DC, and Bethesda, MD. The move is part of the Base Closure and Realignment (BRAC) Act of 2005. Fairfax County is conducting commuter workshops at these locations to let employees know about various options for getting to work. FABB was invited to attend the first workshop that was held at the Reston office today. The new NGA location is referred to as NGA Campus East. It's located less than 3 miles from the Franconia-Springfield Metro station. Given the number of employees coming to the new site, a mini-bike sharing system seems like an ideal solution to moving people from the station to the campus. It could be implemented with station location on the NGA campus, in Springfield, and at the Metro station.With 8,000 new employees commuting into the new offices, traffic and parking, which is limited, will be a nighmare. Along with county bike program staff, we discussed various bike routes to the campus with employees who live within easy bike commuting distance of the new site. The Fairfax Co Parkway/Franconia-Springfield Parkway trails are just north of the new site. A new trail is being built across the Parkway on Rolling Road, and trails and bike lanes will lead into the site from both the Rolling Road and Backlick Road entrances. Saris Stack Racks are being installed in the parking garage. Bike lanes or a shared use path are still needed along Backlick Rd, the most direct route into the complex from the Metro station. Bicycling conditions in this area have been notoriously dangerous in the past. It's encouraging that there is an acknowledgment that bicycling can be part of the solution for moving people in that area, and that some new facilities are being planned for the move. I-95 still presents a significant barrier to bicycle travel in that area and more options are needed for crossing. We plan to check out the new location in the near future. 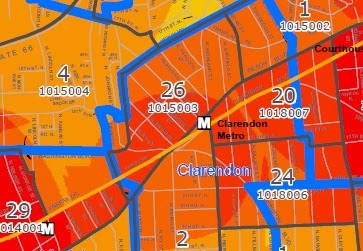 Earlier this year (2010), the City hosted an interative online tool to receive citizen input for this plan. The results have been tallied and summarized. To view the results visit this page. Data collection is expected to be completed in 2010. Community meetings will be scheduled this winter/early spring. Additional comments can be sent to Wendy Block Sanford - wblocksanford@fallschurchva.gov. There is also a committee developing a Safe Routes to School Plan. KLS Engineering is the consultant helping with the plan. Read a summary document on the Falls Church SRTS plan, which includes good information about implementing a SRTS program and applying for a Virginia SRTS grant. Guidelines for 2010 grants are on hold until a new SRTS coordinator is hired by VDOT. Today FABB learned that we received funding from Transurban, one of the companies involved with building the HOT lanes project, for bike light giveaways, purchase and installation of bike racks, and funds for conducting bike commuting seminars. Last year FABB received a grant from Transurban for our first bike light giveaways. Many people depend on bicycles for transportation and must ride at night. Providing front and rear lights helps ensure they will be visible and safe. Last year we installed approximately 160 sets of lights at four bike light giveaways. This year FABB again applied for funds to purchase lights. We expanded our application to include funds for the bike racks that will be installed in places lacking adequate bike parking along the HOT lanes corridor. 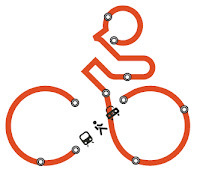 We will also be conducting bike commuting seminars at large corporations in the corridor. At the seminars we talk about bikes and other gear needed for commuting, clothing strategies, safe cycling skills, and bike route map resources. Thanks to Transurban for supporting bicycling in Fairfax. 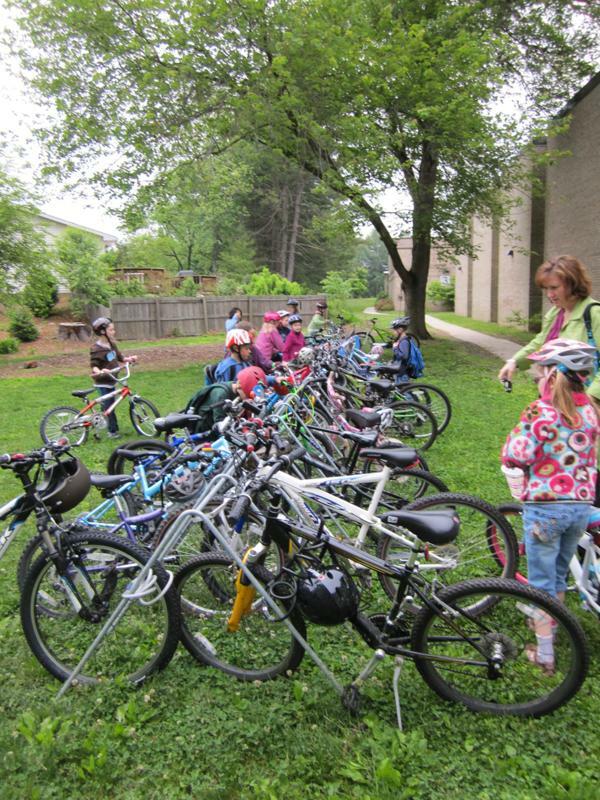 Update: The Wolftrap Elementary School in Vienna has a bike train, Wolfie's Bike Train, which will be running again this Wednesday. As we mentioned on our Facebook page, yesterday FABB and others toured Tysons by bike to check out existing, and possible future locations for, bike facilities in Tysons. The tour began at Kilmer Middle School on Wolftrap Rd near Gallows Rd, just south of Tysons. 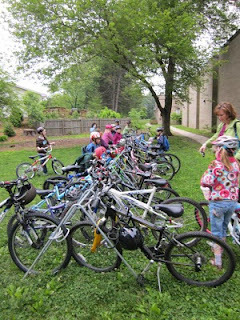 We had heard that the new bicycle and pedestrian bridge connecting Wolftrap Rd made it much easier for kids living in the neighborhoods to the west of the bridge to bike and walk to school and that there was demand for new bike parking. 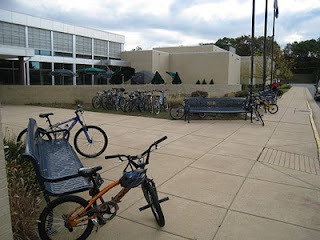 As you can see from the photo, bikes were parked everywhere in front of the school The rack, in the center of the photo, was completely full and there were bikes locked to all the benches in front. 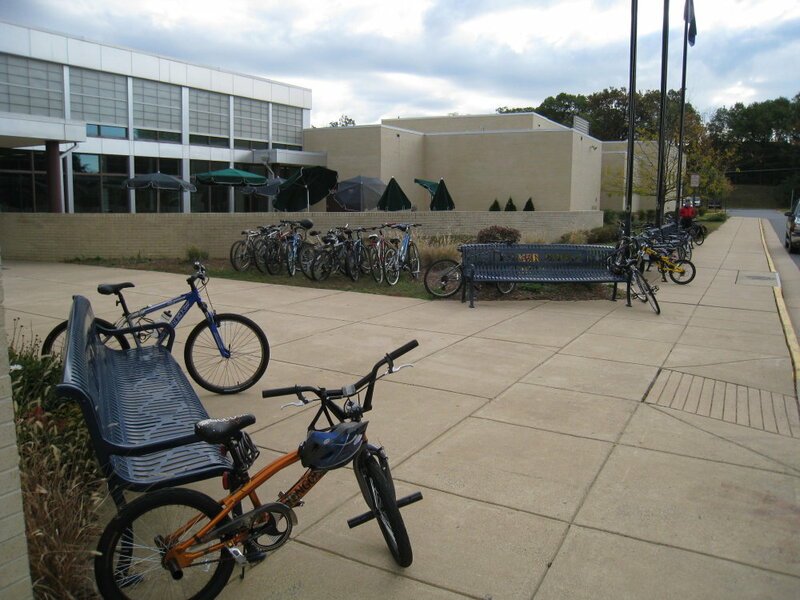 Fortunately the school administration is supportive and allows the bikes to be parked there. According to the dean of students, who is a cyclist, the school is working with the bike coordinator to add more bike parking. The dean also provides bike safety information for the biking students. This is a perfect example of how a small investment in infrastructure can make a significant difference in getting kids out of cars or buses and onto bikes, and the Safe Routes to School program is a way for other schools to find the money for these investments. This week members of FABB and some concerned parents met with Supervisor Hudgins to discuss how Fairfax County and the Fairfax school system can be more supportive of kids walking and biking to school. From past experience we know that the benefits of walking and biking to school are rarely if ever mentioned to parents by the school system. The problems associated with driving kids to school, such as increased congestion and air pollution, are also not discussed. Instead we build kiss-and-ride lots to facilitate this behavior, making traffic at schools worse. According to one teacher who bikes to school, the most dangerous place for him to ride is the immediate area around the school. In one study it's been estimated that around 21-27% of morning traffic is attributed to parents driving their children to school. A school will not ordinarily be held liable for injuries sustained by children while they are walking or bicycling to school simply because the school encourages children to walk or bike, where injuries occur off school property, and parents have been reminded that the school is not responsible for supervising children who walk or bike to school. The FCPS Transportation Services FAQ addresses this issue. If there are liability issues, the Safe Routes to School Program (SRTS) is one way to address them. Unfortunately Fairfax County, the largest school district in the state, has received approximately $10,000 of the $13 million available for SRTS in Virginia. Supervisor Hudgins is very supportive of more kids having the option of safely walking or biking to school and of the SRTS program.With her help we hope to provide a briefing on SRTS to the Board of Supervisors and the school board in the near future. We also hope to identify a school in the Hunter Mill District for implementation of a SRTS program. With new CDC report indicating that one in three adults will have diabetes by 2050, isn't it time that we made it possible for kids to get more exercise by the simple act of walking or biking to school? Today U.S. Transportation Secretary LaHood announced projects to be funded through the TIGER II grants. Fairfax County joined DC and Arlington County in a request by MWCOG to expand bike sharing in the region. Fairfax planned to have several stations in the Reston area. The MWCOG application was not among those selected for funding. A complete list of capital grant recipients and a complete list of planning grant recipients. The biggest bike/ped winner appears to be the East Bay Pedestrian and Bicycle Network. The $43.3 million project, of which $10.2 will come from TIGER funds "will close several critical gaps in the nearly 200-mile bicycle and pedestrian trail system serving the 2.5 million residents of Contra Costa and Alameda counties in California. The project will separate bicycle and pedestrian traffic from automobile traffic, and connect to transit facilities." Other bike/ped-related projects include the Razorback Regional Greenway (Benton & Washington Counties), the Woodside Boulevard Complete Street Initiative, and the New Haven Downtown Crossing project. See the final MWCOG application, A Regional Bike-sharing System for the National Capital Region. New York City's streets are undergoing a major transformation. Bike facilities are being implemented throughout the city, and the number of cyclists is increasing dramatically. This video of a StreetFilm employee's 11-mile commute to work shows some of the bike facilities that are being developed. Mapping Your NYC Bike Commute from Streetfilms on Vimeo. Arlington Co Police Department's Sgt. John Ravinaskas of Arlington Enforcement and Bikes: He summarized recent citations to cyclists and answered questions about cyclists getting points on their licenses and access to crash reports. "He will provide further data, from his crime analyst, responding to various questions raised by BAC members, including the number of accidents caused by cars hitting bikes. Discussion continued on how cyclists are treated in courts and if cyclists can receive points on their license. Sgt. Ravinaskas responded that it depends on how the clerk codes the citation and that cyclists should not receive points on their license. If they do, the clerk coded it wrong so it is important to check the transcripts. A BAC member inquired about a recent accident on Lee and Cleveland involving a cyclist's death and that the police report was not accessible. Sgt. Ravinaskas responded that unless one is involved in the accident, there is no access to the report, as it is not public information." David Goodman's staff report: "The county will be hiring a consultant to assess the bike routing in the Columbia Pike area. Furthermore, VDOT has provided them with their preliminary paving plan for 2011 which includes Glebe Road from Military to Lee Highway. Dave Patton reported that there will be an in-house meeting regarding sharrows and their use. He also noted that the Pentagon’s support of the Boundary Channel Drive project remains an open issue." FABB will hold our monthly meeting tomorrow (Wed.) night at 7:30pm at Patrick Henry Library in Vienna. I-495 HOT Lanes Project—The Wakefield Park pedestrian bridge will close Tuesday – Friday of this week to allow construction personnel to place the bridge on permanent risers (bridge is now about 3 feet taller) and to reconnect the access ramps on the outer loop side. Signs have been posted announcing the closure. Apparently the bridge is closed today; we should have been notified of the closing sooner than today. We've also asked that signs be posted leading up to the bridge, not just at the bridge itself, in Spanish and English. See earlier reports on the Wakefield bridge project. As Richmond-area leaders ponder strategic priorities for the region, they are beginning to listen to what younger generations say they want in a place to live, work and play. And the answer is they want outdoor recreation, especially centered on the James River; a lively, unstuffy art and music scene; and an urban environment that's authentic and stylish. And they're willing to help create it by building trails in James River Park, flocking to art galleries throughout the city every first Friday, or gathering along the riverfront for the three-day Richmond Folk Festival. The James is central to Chesterfield's riverfront plan, which envisions greenways for biking and hiking along the river, as well as along the Appomattox River in the southern end of the county. "We're looking at some major river corridors," said Mike Golden, director of parks and recreation in Chesterfield. One unifying objective for the region is creating more opportunities for trails for bicycling, running and hiking. The Virginia Capital Trail is under construction on a 50-mile stretch from Williamsburg to Shockoe Bottom. Dulles Airport must reduce its carbon "toeprint"—One way would be to develop a bike trail along the Dulles Toll Rd that would allow some of the 36,000 people who work there to go by bike. From GreaterGreaterWashington. "Why do we allow these deaths to occur?" - A Q&A with Peter Jacobsen—Jacobsen is the researcher behind the widely regarded and influential "Safety in Numbers" concept. He is now involved with the "Vision Zero" traffic safety philosophy. From Bike Portland. Car Free City is a Ride Lexington County Takes on a Bike—Formerly known as Bicycle City, Car Free City is being developed in Gaston, SC, located just south of Columbia. Originally from Bike Portland. Kiwi commuters go green with new bike monorail—Google recently invested in this new pedal-powered transportation system, known as the Shweeb. Some have said it could be used in Tysons as another way to get around. The Invisible Cyclists of Los Angeles—Includes a section titled "Less Money = Less Choice + More Danger." 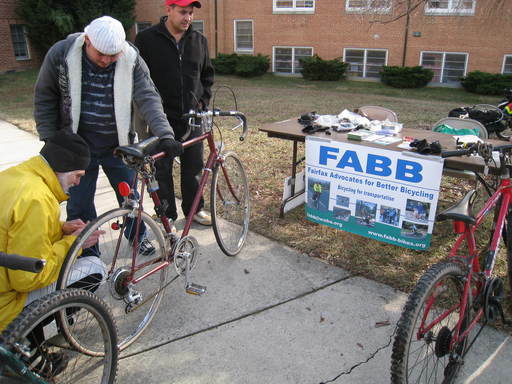 FABB plans to hold bike light giveaways this Fall to reach out so those who depend on bikes for transportation and often ride at night without lights. Originally from Bike Portland. Plan to reduce sprawl will boost health, environment—"Oil dependency, climate change and health-care costs are but three of a growing list of ills, rapidly becoming crises, that give us reason to look again at how we build our communities and what policy can do about it. American suburbanization did not happen by accident; it was heavily subsidized by federal and state dollars, most powerfully in the form of highway funds. The first step to a solution is to reduce incentives for sprawl, including new highways or highway lanes. If we have learned one thing from the suburban experiment, it is that you can't grow a green economy on blacktop." From the Washington Post. TheWashCycle has a good post about the ten year DC Bicycle Master Plan 5 years after implementation. The plan has some specific goals that can be tracked over the years, and it appears that DC government has done a good job of keeping on track at the halfway point. 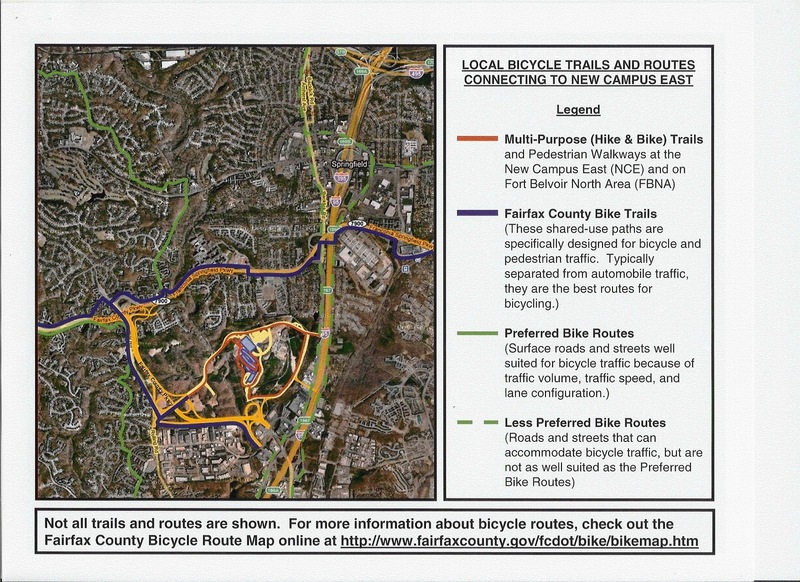 Fairfax County is just beginning the bicycle master planning process, and we hope the plan contains similar concrete goals for making the county more bike-friendly. Fairfax County is home to many historical sites, and many are accessible by bike. The county recently received Transportation Enhancement funds for a map of civil war sites. At least their application was approved; we're not sure if they've actually received the funds. This extraordinary site, located on land owned by Gunston Hall, was intermittently occupied for more than 13,000 years, from Paleoindian to possibly early European contact years. The site yielded thousands of artifacts, 27 cultural features and 7 radiocarbon dates, and a new understanding of the human ecology of Mason Neck. Why not take a ride along the Mason Neck Trail, check out the ribbon-cutting at 3:30pm and enjoy refreshments at the visitors center. Here's a map of trails in Mason Neck Park. Information about the Mason Neck Trail project. 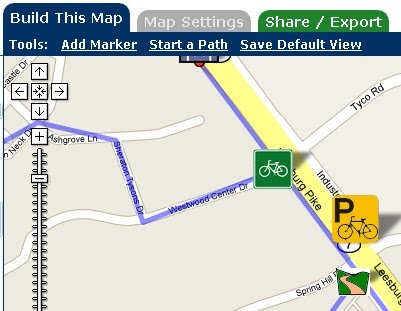 Mason Neck inset on county bike map. That's the name of the latest Fairfax County park planning effort now underway. A public meeting is scheduled tonight, Oct. 14, at the South County Government Center, 8350 Richmond Highway, Alexandria starting at 7pm. This is the last of four regional meetings held by the Park Authority. Sorry for the short notice. As we saw with the Wolftrap bridge connection, parks trails can play a vital role in providing much needed community bicycle connections. The park authority is getting much better about considering non-motorized connections to the parks themselves as well. Local residents should have the option of biking the short distance to a local park, but that's not often possible. Now is your chance to let the Park Authority know that you want to access our great parks by bike, and you want to be able to securely park your bike once you arrive. We also encourage the Park Authority to work with the bicycle program to help connect our neighborhoods with trails through parks. Great Parks, Great Communities 2010-2020 Comprehensive Park System Plan, the draft parks plan, is now available for comment. The comment period ends on November 15. Send comments to Parkmail@fairfaxcounty.gov. We were out of town last week during International Walk to School Day. Wolftrap Elementary School in Vienna celebrated the event, but there was little official support elsewhere in the school system. It's not just our kids who will benefit if we can make cycling and walking part of the daily routine again, as you know if you've ever tried to squeeze by the line of cars jamming a street outside a suburban school. "The sum total and type of benefits that will come when more kids bike and walk to school is amazing," says Blumenthal, who is also president of the Bikes Belong Foundation. "It's not just that kids will be healthier... In many parts of the U.S., 20 percent of morning traffic is one parent driving one or two kids to school." The purpose of the Safe Routes to School program is to address liability concerns by assessing existing routes to school, suggesting improvements, and obtaining funds to implement the improvements. If the county does not participate in the program, there's little hope that the current situation in which very few kids walk or bike to school will not change. There's money available for this program, and Fairfax public schools, the largest school system in the state, should be participating. As far as we know, currently only one school is receiving SRTS funding, Lynbrook Elementary School in Springfield. More evidence is showing that as the number of bicyclists increases, the crash rate does not show a corresponding increase. Research has been steadily showing, actually, that the more people are out there riding bicycles, the safer bicycling becomes. As ridership goes up, crash rates stay flat. It's happening in Portland (see page 11 of this report [PDF]). It's happening in New York City. Much of the ridership increase is due to cities' investments in bicycle-specific infrastructure. But the efficacy of that infrastructure for safety is often questioned. And there's one theory—based on a growing body of data—that suggests that a few painted lines on the road, bike racks, and traffic lights form only part of the safety equation. And maybe a smaller part than we tend to assume. The phenomenon, dubbed "safety in numbers," was first identified in 2003, in an academic paper by public health researcher Peter Jacobsen [PDF]. After being asked by officials in Pasadena, Calif., if their city "was a dangerous place to bicycle," Jacobsen began looking at crash data from various communities where bicycle ridership had fluctuated over time. As we mentioned in an earlier post, an interactive mapping tool is now available for bicyclists who are familiar with the Tysons area to provide feedback to the contractors who are developing the Tysons Bicycle Plan, on bike facilities that are needed there. The BikeTysons site uses the Community Walk software to allow users to add routes and markers showing where bike facilities are needed. Cyclists have been adding many suggestions to the map. Others can then comment on those suggestions. Log in using BikeTysons as the username and password. To enter a route, click on Start a Path and then enter points. You can then add a comment to the line by clicking on one of the endpoints, "Promote to Marker", then adding the comment. The presentation given at the Sept. 30 public meeting is now available on the FABB Tysons Bike Plan page. Perhaps the biggest retrofit of all is happening in Tysons Corner, Va., the virtual archetype of an auto-dependent, sprawling edge city. Located near the junctions of three major highways, it boasts 25 million square feet of office space and four million square feet of retail space. Decades ago developers hailed it as the wave of the future—one of hundreds of new satellite centers that would render our old downtown commercial centers obsolete. But Tysons Corner has lately been losing out. Its perpetual traffic gridlock and its lack of human energy have caused home-buyers to choose other places. Some companies that were headquartered there have even moved back into the District of Columbia. The full version of the WSJ column, where the image above appeared, is entitled Suburban Renewal by Richard Florida. However, such storage may become more common in the District starting in late 2011, when the city's zoning laws are expected to be updated. According to a draft of the regulations issued last month, new residential buildings with 10 or more dwelling units will be required to provide three long-term bicycle parking spaces per four units and one short-term bike parking space per 20 units, with a minimum of two bike parking spaces in each case. Noticeably absent is any mention of Fairfax County, which has no bike parking requirements or guidelines. The county has been developing bike parking regulations since November 2007. The Commonwealth Transportation Board (CTB) is proposing major policy changes to the Transportation Enhancement (TE) fund that could severely cut funding for bike and pedestrian projects in Virginia. I need you and your members to take a few minutes and send an email or note to the CTB and stop this before it's too late. We need you to send a note to the CTB opposing this by October 19. Please ask the Chairman of the Commonwealth Transportation Board, Secretary of Transportation Sean Connaughton (SEAN.CONNAUGHTON@GOVERNOR.VIRGINIA.GOV) and the entire Board to oppose these changes. Let them know that you want these funds to be used for core bike and pedestrian projects, not to develop scenic highway programs or to pay for tourist brochures. I have attached a sample note at the end of this email. The CTB annually receives 150 - 200 requests for proejects each year but can only fund around 100 of these requests. In July, the Governor asked that $4M - nearly a quarter of the available funds - be spent on, "high priority statewide initiatives (tourism based initiatives, etc." to build tourist centers, and funding programs such as promoting scenic roads and cultural attractions. The VBF doesn’t oppose promoting tourism, but Virginia already budgets over $18M for the Virginia Tourism Corporation to do this. They don't need our TE funds to print more brochures. Please share this with your members and ask them to send a note today. Thanks for taking the time to make a difference. Please share this message with the entire CTB. I urge the Commonwealth Transportation Board to oppose the proposed changes to the Transportation Enhancement Funding policy but instead prioritize these funds on key projects which build facilities to promote walking, cycling and alternatives to driving our cars. As a resident of Virginia, I want to have choices in transportation and the Transportation Enhancement Fund should be used to fund alternative transportation facilities. Please prioritize these limited funds on key projects that benefit the Commonwealth and citizens by moving people, not paper. Just last year, under Governor Kaine, the Commonwealth Transportation Board did just the opposite and approved proposed changes to the Transportation Enhancement Program policy that would provide more funding for bicycle and pedestrian projects. After McDonnel took office, he decided there was too much money for bike/ped projects and instead suggested that money be used to fund rest stops for motorists. Update: We just sent a message to the above email address and it bounced. We're searching for a better address for the VA Transportation Secretary. Update II: The correct address appears to be SEAN.CONNAUGHTON@GOVERNOR.VIRGINIA.GOV. We converted it to lower case and that apparently made a difference. I thought email addresses were case insensitive. Because of the weather, the HOT lanes project team will raise the Wakefield Park bridge Friday and Saturday. The tie in work to match the bridge with the temporary access ramp will occur Monday and Tuesday. The bike/ped bridge will either reopen late Tuesday or Wednesday of next week. We will post new signs on the bridge once the rain stops. Apparently signs announcing the recent closure were only posted on the bridge and not at the park entrance as we had requested. They were also only in English. We'll ask again that signs be posted on routes leading up to the bridge. If we hear any more news we'll post it here. If you hear other news, please leave a comment.